Since my undergrad days, I have been interested in Signal Processing. As an engineer developing multimedia systems for personal video players, I was fascinated by the how video and audio were processed for different applications. After coming to UCSB, I became particularly interested in Image Processing and Computer Vision thanks to courses I did under Prof. Manjunath, Prof. Lee and Prof. Turk. The course on Computational BioMicroscopy under Prof. Liebling introduced me to an exciting application of image processing....biology. My current work at Eyenuk revolves around building automated tools for screening vision threatning retinal diseases. I also work on a image aesthetics analysis engine called inapic. For my Ph.D I have worked with Prof. Liebling on reasearch highlighted below. You can view detals about my thesis here. (P.S: I built our company website, so shoot me an email if you have feedback). Please visit my Publications page for more information. Current methods to build dynamic optical coherence tomography (OCT) volumes of the beating embryonic heart involve synchronization of 2D+time slice-sequences acquired over separate heartbeats. Temporal registration of these sequences is performed either through gating or post-processing. While synchronization algorithms that exclusively rely on image-intrinsic signals allow forgoing external gating hardware, they are prone to error accumulation, require operator-supervised correction, or lead to non-isotropic resolution. In our IEEE TMI 2013 paper, we propose an image based, retrospective reconstruction technique that uses two sets of parallel 2D+T slice-sequences, acquired perpendicularly to each other, to yield accurate and automatic reconstructions with isotropic resolution. The method utilizes the similarity of the data at the slice intersections to spatio-temporally register the two sets of slice sequences and fuse them into a high-resolution 4D volume. 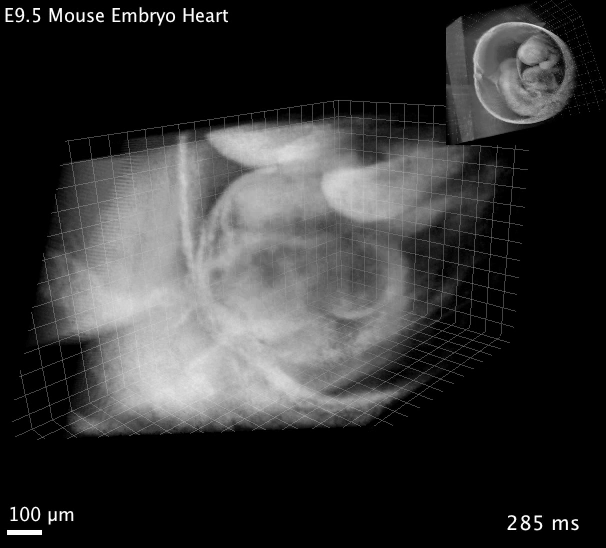 We characterize our method by using (1) simulated heart phantom datasets and (2) OCT datasets acquired from the beating heart of live cultured E9.5 mouse and E10.5 rat embryos. We demonstrate that while our method requires greater acquisition and reconstruction time compared to methods that use slices from a single direction, it produces more accurate and self-validating reconstructions since each set of reconstructed slices acts as a reference for the slices in the perpendicular set. Blood flow and motion of cardiac structures is a 3D+time phenomenon. So we need to analyze flow in 3D to quantify tissue deformation and blood flow in the heart. We extended the separation algorithm for 3D+Time high-speed brightfield datasets. The separated structures can be pseudo-colored to get a multi-color visualization of the cardiac volume with a greater degree of specificty than the raw BF datasets as shown below. For more information regarding this work see our IEEE TIP 2012 paper. 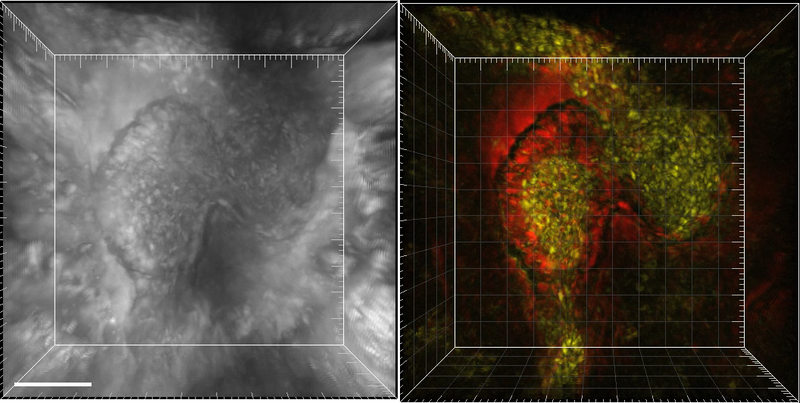 Recent progress in optical coherence tomography (OCT) allows imaging dynamic structures and fluid flow within scattering tissue, such as the beating heart and blood flow in mouse embryos. Accurate representation and analysis of these dynamic behaviors require reducing the noise of the acquired data. Although noise can be reduced by averaging multiple neighboring pixels in space or time, such operations reduce the effective spatial or temporal resolution that can be achieved. We have developed a computational postprocessing technique to restore image sequences of cyclically moving structures that preserves frame rate and spatial resolution. The signal-to-noise ratio (SNR) is improved by combining images from multiple cycles that have been synchronized with a temporally elastic registration procedure. 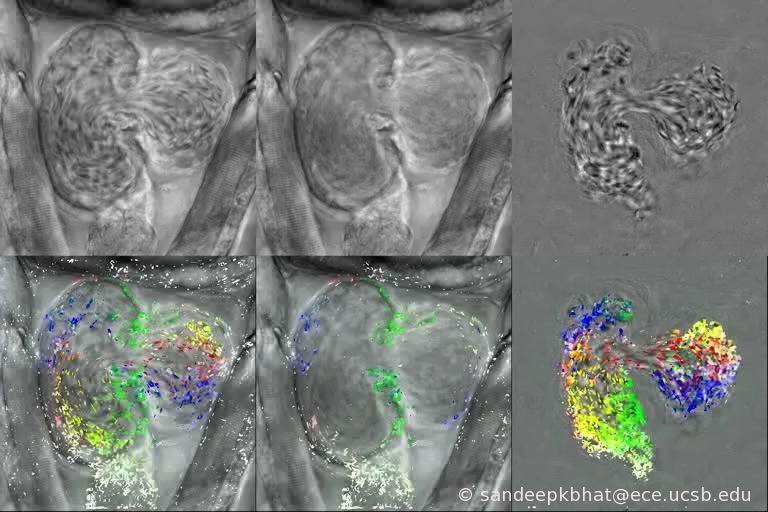 Here we show how this technique can be applied to OCT images of the circulatory system in cultured mouse embryos. Our technique significantly improves the SNR while preserving temporal and spatial resolution. This is what I have been working on since Summer 2008. 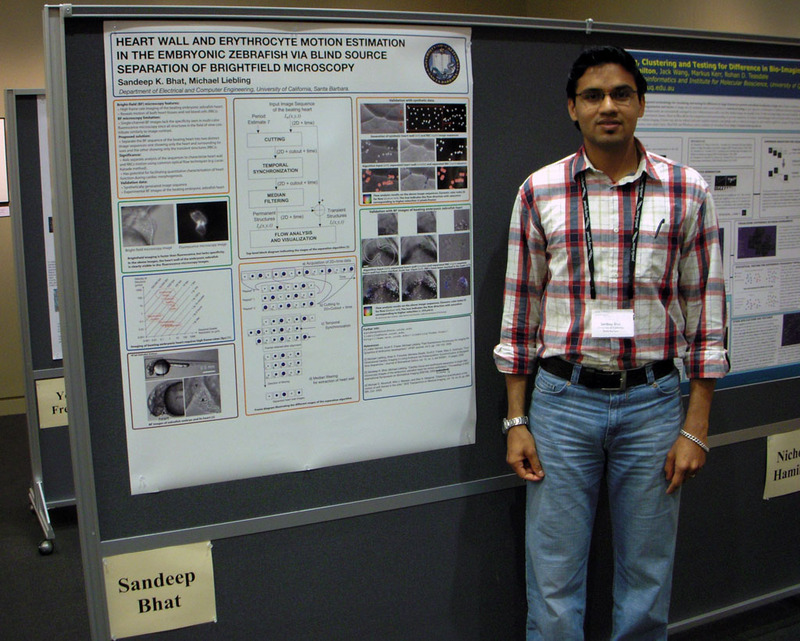 I presented this work at the IEEE ISBI'09 conference. You can download the paper from the publications page. A variation of this work was presented as a poster in the BioImage Informatics Conference in 2009. 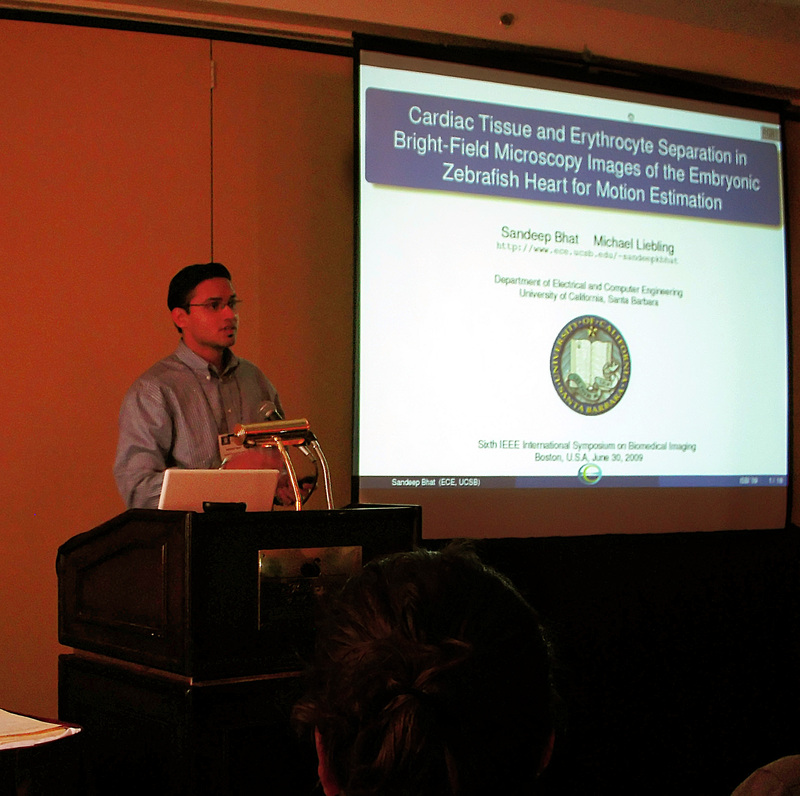 It was also part of a talk by Prof. Michael Liebling in the same conference. 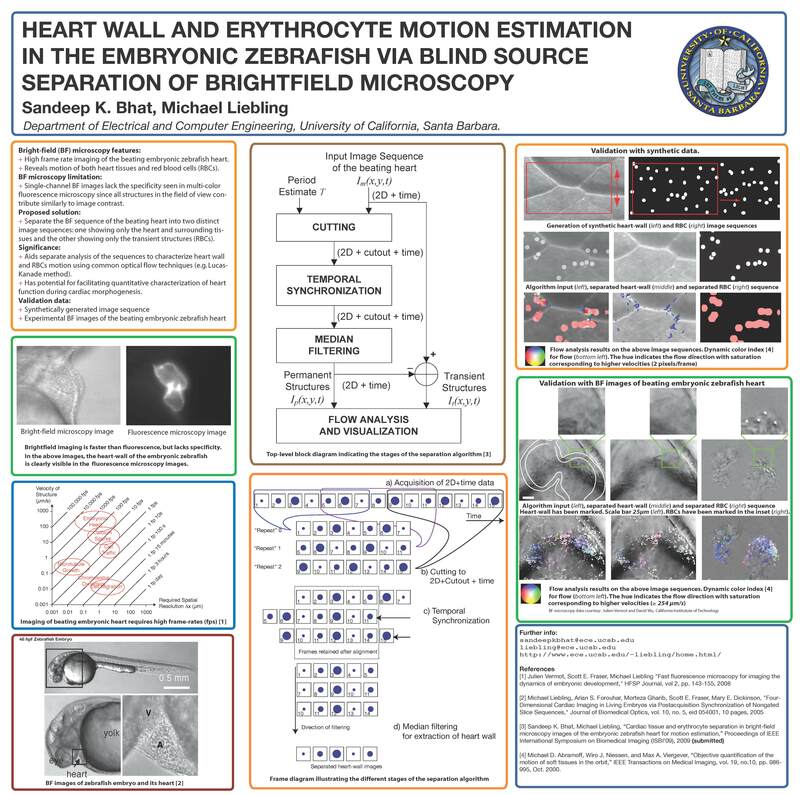 Bright-field (BF) microscopy enables imaging the beating embryonic zebrafish heart at high frame rates, thereby revealing motion of both tissues that form the heart and red blood cells (RBCs). 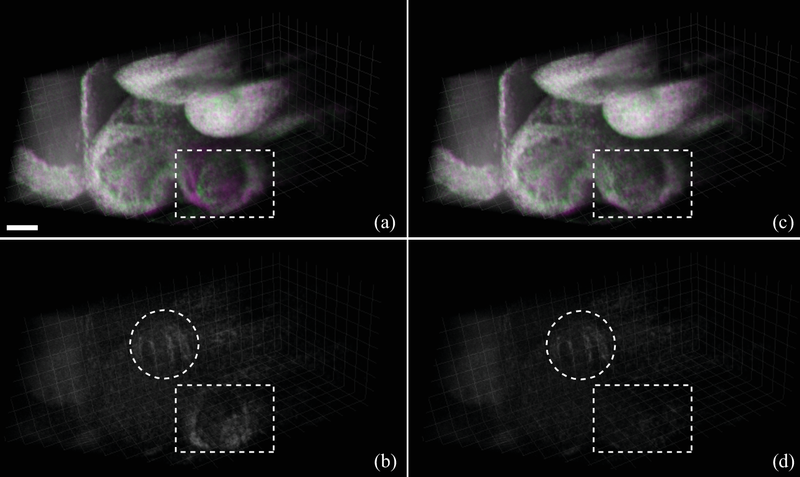 However, single-channel BF images lack the specificity seen in multi-color fluorescence microscopy since all structures in the field of view contribute similarly to image contrast (top row, left image). We have developed an algorithm that overcomes this limitation by separating a BF sequence of the beating heart into two distinct image sequences: one showing only the heart and surrounding tissues (top row,middle image) and the other showing only the transient structures such as RBCs (top row, right image).These sequences can be analyzed separately to characterize heart wall and RBCs motion using common optical flow techniques (bottom row). In the above figure the flow analysis was done using FlowJ plugin in ImageJ. 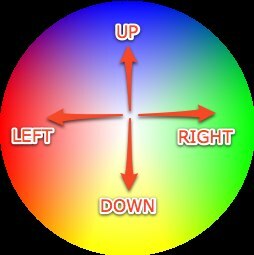 The flow is visualized as a dynamic color map where the hue indicates the direction of flow and the saturation indicates the flow velocity. This technique has potential for facilitating quantitative characterization of heart function during cardiac morphogenesis.